Why A 60's Pony Car? If you think about it, choosing a 60's American v8 as the practical family car is like badass recycling. It's greener than a Prius as it has already been used well beyond what would be needed to offset it's carbon production value, it has no massive battery that creates acid rain in some far off corner of the world, and it saves one more vehicle from the scrap yard. So people don't generally send 60's era American v8's in decent shape to the junk yard, but it's not unheard of. In my mind this might as well be my version of the Crusher Camaro. If you don't know what that is, we can't be friends. Well, at least do myself, you, and the rest of the automotive world the favor of reading up on it. You can thank me later. Back to the topic at hand. When looking for a car with back seats to haul my girlfriend and her daughter around in on the rare occasions we all needed to travel somewhere at the same time and I wasn't on my motorcycle for the peace and quiet... I mean fresh air. We agreed it should be something cool and fun, something we wouldn't mind keeping, and she said she would like it to be something that she could end up learning to work on. 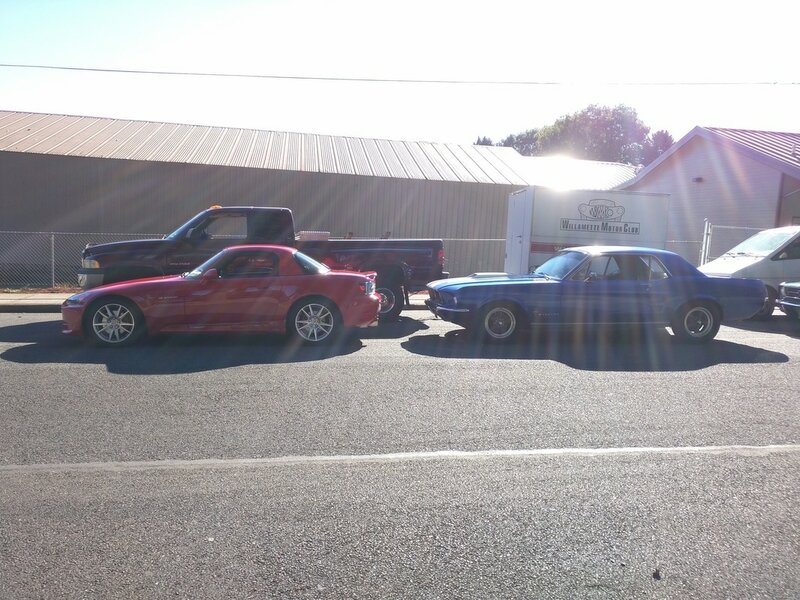 We quickly narrowed it down to either a 60's muscle car or a newer performance car. 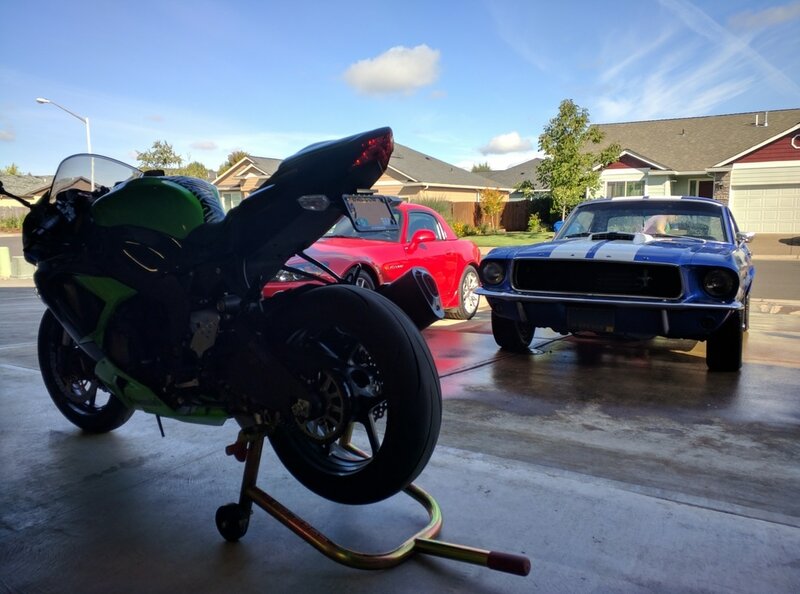 I have been around a lot of different muscle cars in the past and my family members have owned everything from a 68' Camaro SS to Cuda to Stingray Vett. When it comes to cars, I only discriminate against stupid and boring, not county of origin. It's a dangerous thing once I start car shopping. 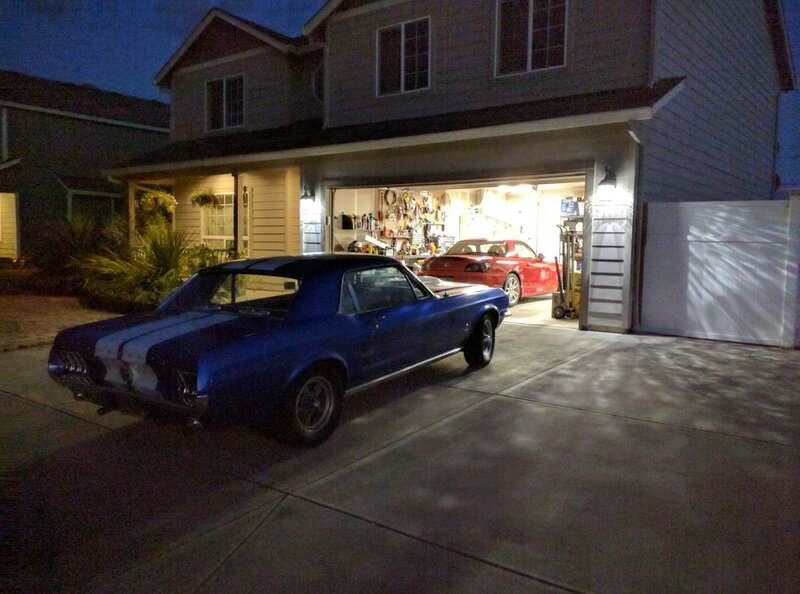 I started to gravitate toward my typical favorite searches, the 68' Camaro, 93' RX-7, S2000, etc. Obviously a two seat sports car doesn't meet the back seat requirement, but that didn't stop me from shopping for them. I had SW20 MR2s, RX-7s, a JDM imported 300ZX twin turbo (why not drive on the wrong side of the car?) and a few others on the list, all of which I told myself and everyone else was just so I could see the options. Next thing I know, I'm buying an S2000. The justification was that it was to replace the one I had made the terrible decision to trade in a few years prior on the BRZ. Really, it's an S2000, everyone should have one at some point, which means I should have two. 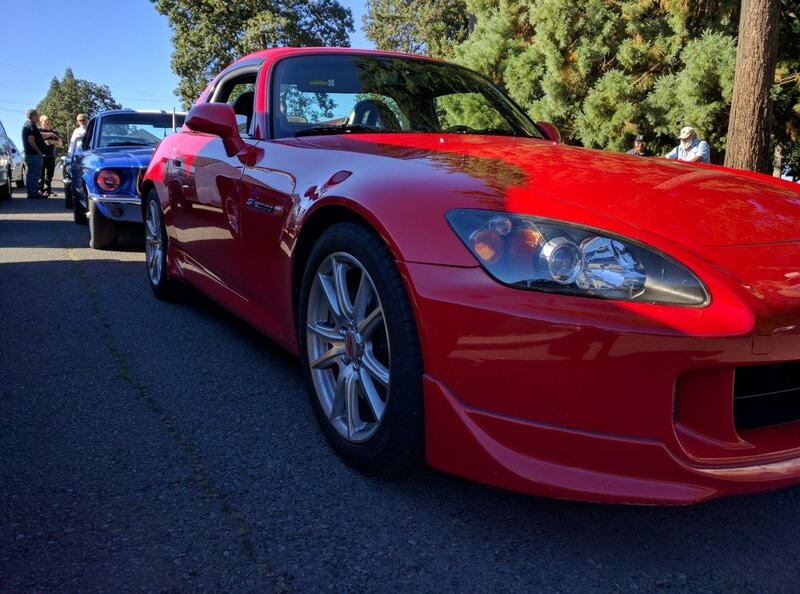 I didn't know which S2000 I was going to buy, I inspected about 5, but I realized that my shopping adventure for back seats had turned into an S2000 buying adventure. 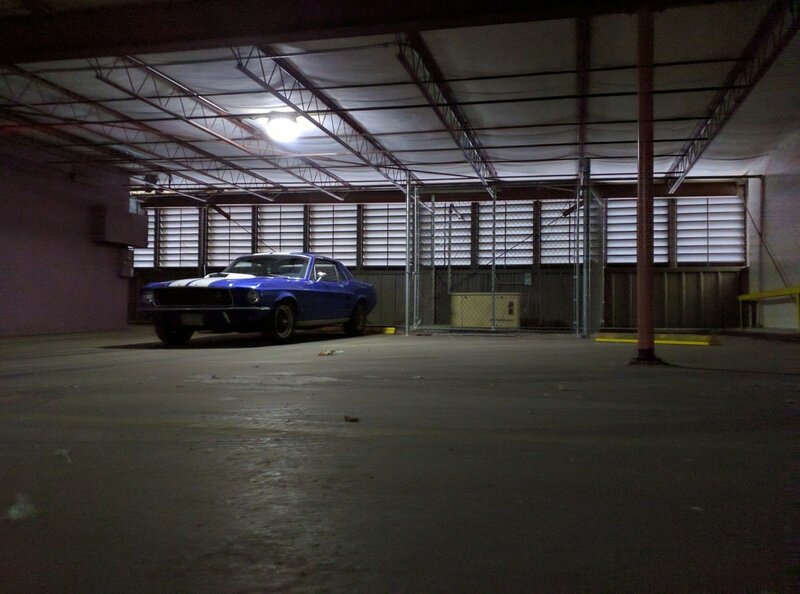 It was during my shopping for the S2000, that wasn't the purpose of the shopping originally, I came across a craigslist ad for a 66' Mustang project in primer. One picture and the girlfriend had to see it. The car was local and the owner had a nice list of parts he had installed on it. On the digital paper of craigslist the car sounded decent. We arranged a time to meet up, grabbed our keys, and headed in to see it. Upon seeing the car we both really liked the idea, but not that specific car. 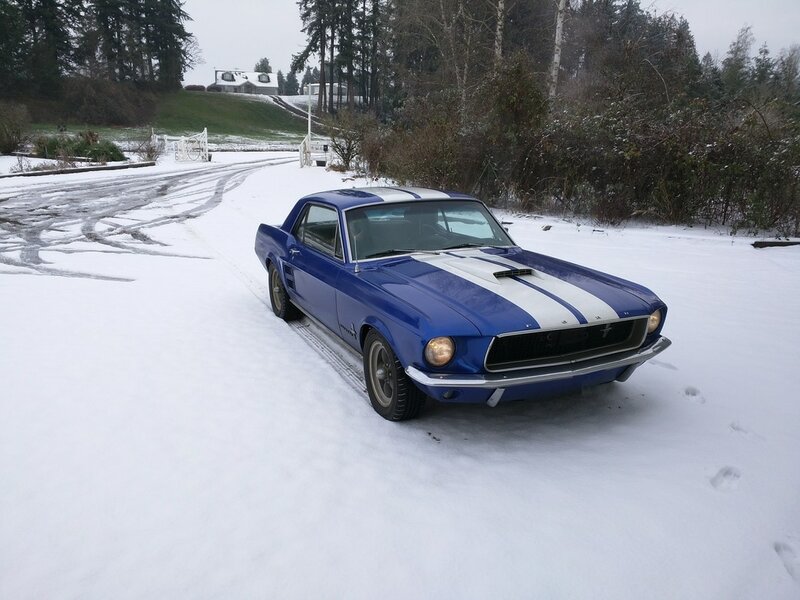 It had too much work to do, had rust that would not be easy to patch, and ill-conceived rear fender mount antenna that created even more rust issues, and had been being daily driven year round in Oregon in nothing but primer. To top it off, my girlfriend wanted to look at financing the car as hers to help build credit. If you have never tried to finance a classic car, let me just tell you, primer is not something the lender wants to hear. We would have to continue the search, but it did give us the idea that we really did like the 60's coupe body style for the Mustangs and liked the little 289 v8. A few weeks later and the search looked like it was not going to be in our favor. The market for classic cars was skyrocketing, most of the cars on the market were either $30,000+ restored vehicles or $10,000 rust buckets. Every time I found a promising lead I was told that the car had either just been sold or that the person was not willing to let me have the car inspected. If the car was going to be financed in any shape or form, it would have to pass both my inspection as well as a shop inspection. With so many people unwilling to have the cars looked at, I made up my mind that an appraisal was going to be mandatory before purchase of anything. One night, when I should have been sleeping, my craigslist hunting struck possible gold. A father son project car that had been family owned for over a decade was up for sale. The car had been purchased by the father for both his sons to drive in exchange for working for the family business. They had painted it themselves, but had made every effort to do it as correct as they could. It had a completely refreshed interior, a rebuilt engine, and a new transmission. The only real strikes against the car was the fact it was an automatic transmission and that it had been parked for years after both sons had gone off to college. The father had decided to let the car be sold for a down payment on a house for one of his sons, so they were asking exactly what they wanted for the down payment. It just so happened that the asking price was exactly in the range I was looking to spend myself and also what my girlfriend might actually be able to finance if we went that route. Again we loaded up the car and headed out to check out a vehicle. As soon as I walked up to the car the father opened the door and told me to hop on in and fire it up but warned it was stone cold and had only been moved about 20 feet from the storage building to the yard to be washed off. That's a good sign to me. ​This time the vehicle was as described. It smelled like a car someone had tried to dehumidify and air freshen, but had been mostly stored for years. The paint was certainly a 15 foot paint job, good thick clear and color, but obvious new painter mistakes like orange peel under the clear from not wet sanding. The engine fired right up and idled pretty well, but seemed to be on the rich side. I expected it to run rich with the electric choke on, but it never really came down after a few minutes, which told me the choke either wasn't working or the carb was out of tune. The interior was in excellent shape, obviously refreshed and installed well. It had an aftermarket stereo and retrofit 6" speakers up front and 6x9's in the rear. Yep, exactly what I would expect if high school age kids had input on the car. I popped the truck and pulled up the carpet. Nothing but very mild surface rust, in fact, more of a discoloration than actual rust of any kind. Another very good sign. After letting the car warm up the father suggested I take it for a drive, but warned me that it had not been driven in a while and so to make sure the brakes had pressure and he would check the tires before I set off. With the tires topped off, I set out. Leaving there driveway there was a long rural straightaway through tall old trees. As I accelerated out of his driveway you could hear the bellow of the carbureted v8 echoing off every tree as if it were beating them into submission, and they liked it. I let the car come up in revolutions slowly enough to make sure the oil pressure was good while straining to hear any worrisome sounds from under the hood. Upon cresting a hill I saw a 90 degree turn coming up and begin to apply the brakes. Calling drum brakes that have been parked for years brakes is being kind. I gave it some pedal, nothing happened. I gave them a little more, nothing happened. I let up on the pedal and reapplied. At this point it became less braking and more rapidly converting tires to smoke as each wheel locked up in a random order. The rear right locked first, then rear left, giving the car a nice diagonal trajectory. It would have been great for an entrance to the corner while drifting, but was piss poor while test driving someone else's 40+ year old car. I eased back until they unlocked while steering into the skid and came around the corner quick enough to see the huge cloud of smoke blow on through and into the field I could have easily visited. Once the brakes and I had reached an understanding, mostly that they chose to work for no man and would really like to be bled. I found a nice gravel pull out to turn around in and head back. Of course, in order to properly utilize said turn around, I was obligated to hammer the throttle and play the v8 American anthem past some bicyclists headed the other direction. Normally cars flooring it past cyclists elicits swearing and strange finger based gestures, but not in a classic Mustang. They cheered and waved as I past. Granted, it was not at a particularly high rate of speed, but it did sound good doing it. The steering was sloppy and overly responsive all at the same time. The brakes didn't really brake. The suspension was oddly overly stiff yet bouncy, and the wind noise was incredible having all the major door seals completely dried out... but I loved the car. After returning from the test drive the owner and I talked about the history of the car. The father had a 64' convertible Mustang as well and felt he couldn't take care of both cars adequately as the convertible was his original car and had seen the best care. This car had been sold to him from a family that had owned it since new and happened to be the mechanic that did any major work he needed on the convertible. Their stipulation was that he didn't sell it or chop it up into too much of a hot rod. Originally it was brown, which is why they had painted it. According to him and his son, the car didn't really need paint, but no one wanted to drive a brown car to high school. So, blue it is with white GT stripes. Personally, I love the color combination. 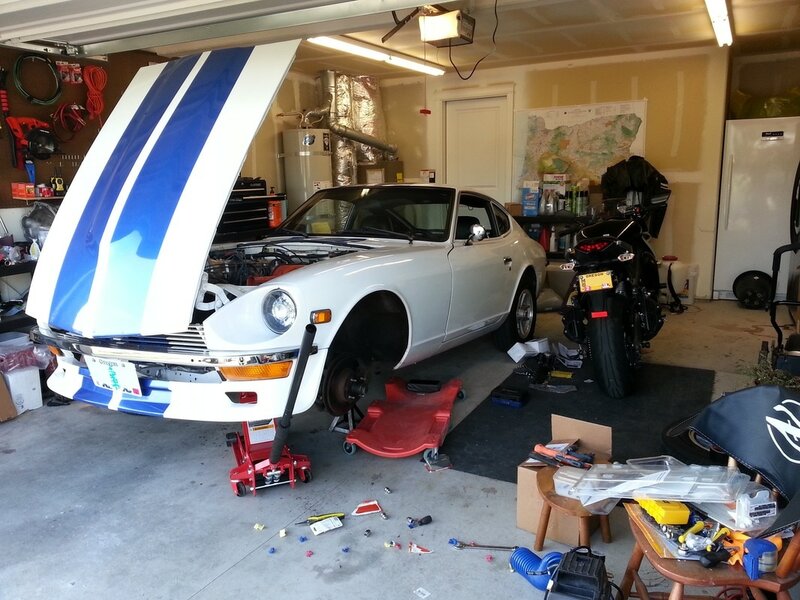 Interestingly enough, it's the same color combination but in reverse of what my current 240Z had when I got it. I told him I would think about it, but that I was definitely interested in the car. After rolling the car around in my head for a day or so, I called up the local credit union to see what the odds were my girlfriend would be able to finance it. It is never fun dealing with lenders, the loans officers always want to make sure you are happy and they are getting money, but the real approval comes from underwriters who wants to make sure they are at minimum risk. In the end they said it was possible, but they would need and appraisal and final price in order to try to run the loan through. Of course, everyone selling a car private party loves to hear that they need to take the car to an appraiser, but the owner actually took the news pretty well. I coordinated with the son and the father drove the car the hour down to meet me at the appraisers. They brought the car down after lunch on the only day the appraiser had available, I kicked them in some money for the trouble and gas, and we settled in for some car BSing while the appraiser did his thing. I learned all about previous cars he had, why he liked the Mustangs, and why he agreed to let his son sell this car for a down payment. Once the inspection was complete we called the credit union to let them know that it appraised over 30% above asking, which should make her financing it a no brainer. We were very mistaken. It turned out that no matter how much maneuvering I did, there was no way they wanted to lend on that car in her name. Her student loans and existing car just made it impossible. After an hour of back and fourth with the underwriters I figured it was time to resolve to fact, I was buying the car. Being anything but new to buying old cars, my first call was to my insurance. I opened with telling them that I found another one and that I wanted to make sure I could insure the full value of the car. After some number crunching they came back and said that the car would only insure for half the asking price. The nice lady who was attempting to dash my hopes was very reassuring that AFTER I bought the car, we might be able to do better. I'm not much of a gambler. I ran a through options through my head really fast, tried to talk to someone higher up at the insurance company to explain that I had an official appraisal stating a value, but could get no where. That's when it hit me, GAP. For those who don't know, GAP insurance is a form of insurance you can place on a vehicle with a loan that will work to insure the difference between the vehicle value at the time it's destroyed against the remaining balance. If I were to buy the car with a loan through my credit union, they offer GAP for virtually nothing. Back on the phone I went, but this time, after 20 minutes I had a plan. A few quick signatures later and signing away my first born (jokes on them, I'm not having any) the car was mine. I backfilled the value risk with the GAP insurance and after a week or so I was able to get the insurance company to honor the appraisal and insure it for that amount. Suddenly I found myself with a nearly 50 year old car to start bringing up to my standards. I hate the idea of owing money, but I also received such in insanely low interest rate. In fact, it was so low I almost couldn't justify paying it off any quicker than the term as it was about as close to free as someone else's money gets. Buying a car is only the beginning of the journey. Amazingly enough, people don't tell you everything wrong with a vehicle before you buy it, even extremely talkative car guys. Once the car was safely in my care, I started down the list of things to check. First off, the fluids had to be changed for safety sake and basic tuneup items had to be checked. With old engines like this they generally use what are called flat tappet cams. They are a style of cams/lifters that do not have a roller at the top of the tappet. This means that as the cam lobe comes around to strike the tappet and begin opening the valve, the only thing preventing one or the other from chipping off into pieces is a thin film of oil. In a roller style tappet, there is a literal roller at the top of the tappet that the cam lobe strikes, providing a reduction in friction and impact, and allowing for much more aggressive cam profiles to be use before the force causes damage. For more information on this and why it is an issue more in the modern world, check out this link. 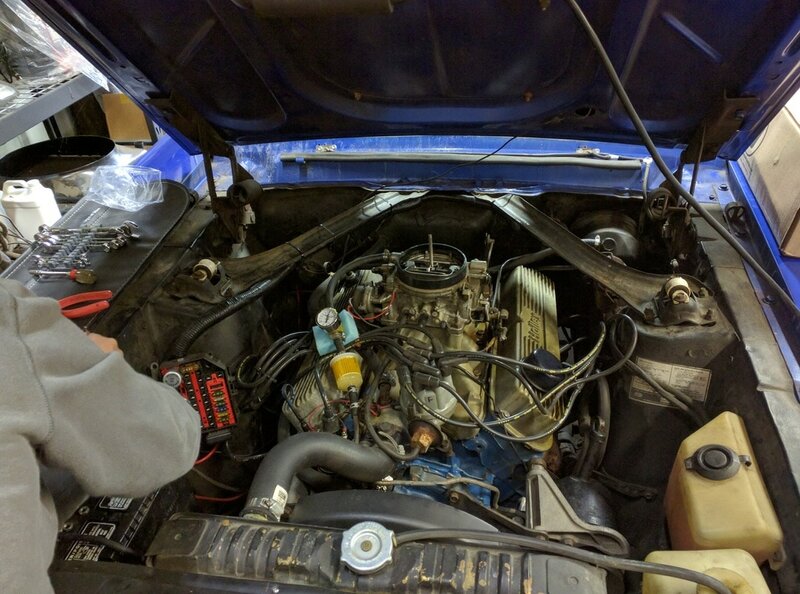 To help protect the flat tappets and the cams, I went with a Valvoline VR1 20w50 oil with high ZDDP. The idea is that the extra zinc/phosphorus adds significant wear protection and longer term protect when a flat tappet engine is spending time in storage. My cars see fairly frequent use, so I also wanted the extra durability for hard driving and the higher RPMs my cars see daily. Upon changing the oil the car seemed much happier, although the old oil was in good shape but dark. I ended up changing the oil twice in a rather short interval just to make sure I cleaned out anything that might have been floating around from years of sitting. I moved on to the transmission, which I was told was new. The story was that after being in storage he fired it up and it wouldn't shift into gear, so he took it to his mechanic who installed a new transmission. These little C4 transmission are about as basic as it gets, so I was surprised to hear they just replaced it rather than repairing it. Since one of the goals of the car was for my girlfriend to learn about working on them, we did a more in depth inspection. Which showed some leaking on the transmission and indicators that it obviously was not new or re-manufactured. The aged buildup on the case made that very evident. When I checked the fluid level, it was actually too high, meaning whoever did the fill probably did not follow the proper procedure. As I dug deeper I encountered a strange problem with the electrical. The car would say it was charging, the alternator was putting out juice supposedly, but the car would end up not starting after driving it around a bit. No problem, in went a new Ultima Red Top I had sitting on the shelf for my Z. Problem solved right? Nope. I took the battery back out, hooked it to a trickle charger to make sure it was fully charged and back in it went. Boom, totally wouldn't start. I hooked a jump pack to it thinking "I'll show you" and was promptly told by the car to take a flying leap as it attempted to start as soon as I turned the battery pack on... no key in the car. This is where the multimeter comes into play. I tested across the battery and only got a few volts. Could just be a defective battery, so I pulled the battery and did a tone test between the positive and negative wires from the car. Obviously, with the key off and out of the car, there should be no tone... there was. Then I started the hunt for a short. The electrical gremlin that had so far managed to embarrass me twice by taking the car from starting and running beautifully to being unable to even turn over in a convenience store parking lot and killing my small lithium-ion jump pack in the process, I was told to check the starter. Since the car had tried to actually start in park with the key off, it must be grounding through the starter somehow. That's a cheap part and I can reach it without more than a floor jack. Off to NAPA I went as they had one sitting on the shelf ready to go and an hour or so later (and some swearing at my jack stands), no difference at all. Out comes the ignition and the gauges so I can check the connections. For those unfamiliar with these old ignitions, the way they come out is to have you put the key in, turn it to a set position, insert something like a paperclip into a small hole to release a detente, that allows you to turn it the other way until it pulls out of the dash. What should it not do? Pull into two pieces with no force and drop all the tumblers onto the floor. Needless to say, the ignition cylinder was bad, and I did not have another on hand. To the internet I went, and so began the great saga of trial and error. During this adventure, why not a small tachometer while I'm at it to replace the blank gauge port in the center of the dash (normally would be a factory option clock), new shocks, new starter relay (to go with the new starter don't you know), new battery, new water temp sensor, heater hose fitting, new alternator regulator, new alternator, new coil, new cap, and new rotor. I traced every wire in the damn car and replaced anything and everything that could be electrical as well as other parts just to make myself feel better. The only thing I could find that seemed to make a difference? The door switch controlling the interior lights. Some fiddling and electrical tape later, the issue was gone. Did I actually fix anything? I'll probably never know. It did open the door to a lot of other little quality of life modifications. As I mentioned before, the car was running a little rich and having a tachometer would make tuning it easier. I bought a simple little tachometer from Amazon (this one) and set to adapting it to fit into the blank gauge pod. I had to disassemble the gauge it's self, remove the bezel, remove some side mounts, but it fit almost perfectly up against the opening. The next challenge was just figuring out how to hold it in place and where to pull power and signal from. The signal would have to come from the coil, which meant I would have to make room to feed the wire through the grommet on the firewall, less than fun. The light I pulled from one of the other gauge lights. It used a little LED which shouldn't pull much juice. Considering the gauge was never intended to be mounted inside anything else, it fit really well. While I had the cluster out I checked all the wires and connections and cleaned up a few that looked like they had corrosion. 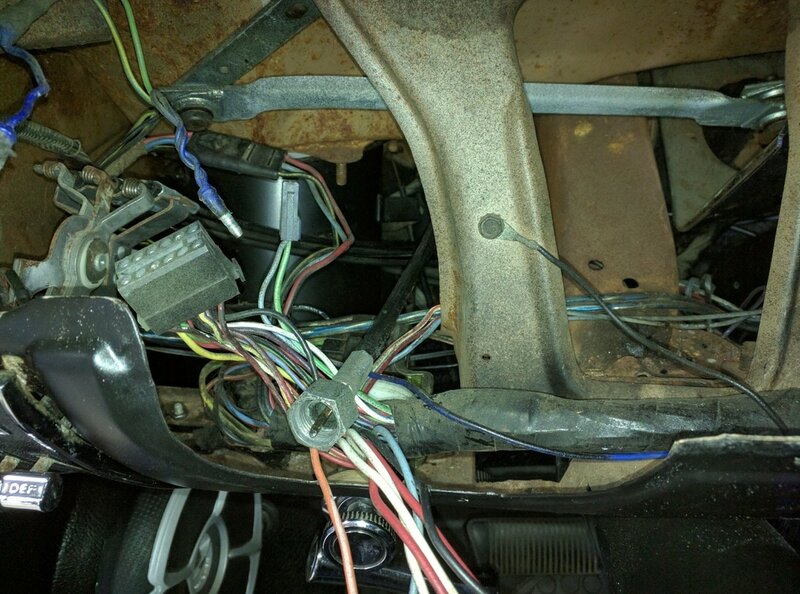 In general the wiring was in decent shape, but some of the splices and reworks the previous owner had done were questionable. 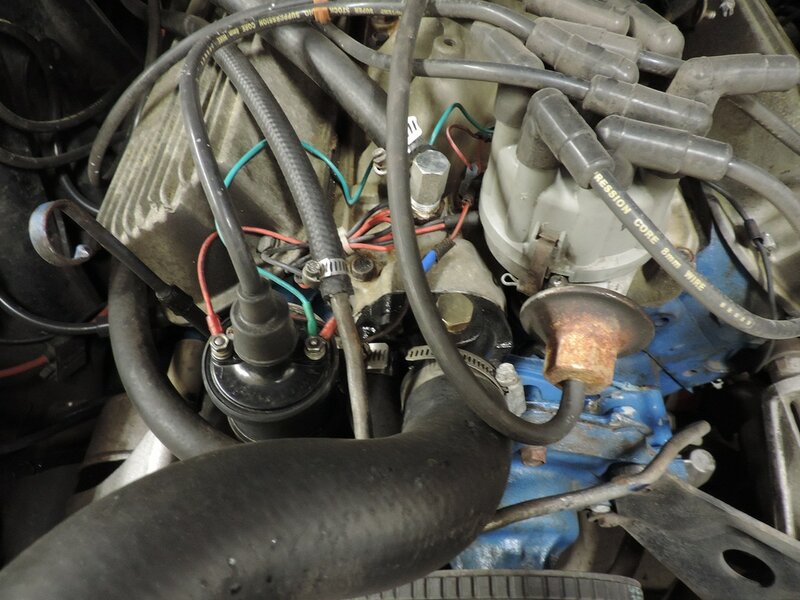 One such change, moving the fuse block into the engine compartment to make it easier to access, worried me with how some of the connections were made. Ultimately, not something I could fix while I was in there. What do you do after spending an absurd amount of time hunting electrical gremlins? You move on to the cooling system. The temperature sensor was not reading correctly, the range was far too small for how warm the engine was. Being as they are dirt cheap I bought a new coolant temperature sensor and put a new connector on the end of the wire. When that didn't solve it, I pretty much knew it must be a ground near the gauge at this point. Since I had just put the gauges back into the dash, I suddenly cared a lot less about completing this minor project and moved on to replacing the thermostat... as an excuse to pull and paint the housing. Everything else, is still dirty as I didn't feel like cleaning decades of grime off the whole engine.